When we flush the toilets in our homes, few of us ever give any thought to the process. It's a routine motion that banishes waste and ensures cleanliness. Routine, that is, until you realize that for those of us in Toronto the treated sewage winds up in Lake Ontario, which is also the source of our drinking water. Here in the Western World, it's easy to forget more than 2.5 billion of the planet's people live without basic sanitation facilities with the result that poverty, suffering and death are commonplace. Sewage is something we rarely think about, but it is of critical importance to our lives since it is inevitably tied to our drinking water. 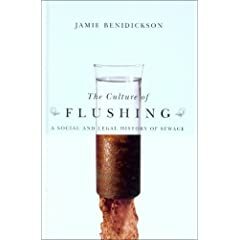 That's why I was recently drawn to read The Culture of Flushing A Social and Legal History of Sewage, by Jamie Benidickson ($29.95 in paperback, $85 in hardcover, UBC Press, 2007). The author, who is a professor of law at the University of Ottawa, demonstrates in this book that the uncontroversial reputation of flushing in our "effluent society" is deceptive. In the post-Walkerton era, Benidickson investigates and clarifies the murky evolution of waste treatment. Historically, in Canada, Britain and the United States, governments dumped raw sewage into lakes, rivers and streams, in the belief that they were nature's sewers and the water would eventually purify itself. In fact, some cities still discharge untreated sewage into the nearest river or ocean. Montreal, for example, dumps 3.6 billion litres of raw sewage into the St. Lawrence River, and the annual output of Victoria, B.C., into surrounding waters is a staggering 34 billion litres. Many still believe the engineering mantra that was, and in many cases still is, "the solution to pollution is dilution." It's hard to believe that Toronto's first wastewater treatment plant, at Ashbridge's Bay, was not built until 1910 not even a century ago. Prior to that, sewage went directly into the lake. Unfortunately, not everyone was happy with the sporadic operation of the new sewage treatment plant on the waterfront. Samuel E. Fieldhouse operated a food, confectionery and ice cream business just opposite the Morley Ave. sewage plant and eventually brought a nuisance action against the city due to the "excrementitious" smells coming from the facility. The "Big Odor" case, as the Toronto Daily Star called the proceedings, became a cause c l bre when it reached the court of Chief Justice William Mulock in December 1917. Fieldhouse won damages and an injunction against the city at trial, and also won an appeal before a four-judge panel of the Ontario Supreme Court in 1918. Ultimately, Fieldhouse was awarded damages of $3,820 in 1921 equivalent to about $38,000 today. Benidickson also discusses this city's tortured history of attempting to provide an adequate supply of potable water for its citizens. On Christmas Day in 1892 the intake valve for the Toronto water supply became clogged with weeds. The municipal supply pipe broke in four places and was caught in the harbour ice. Two days later, local citizens were assured that the restored supply was "at least two-thirds pure." "Thoughtful residents," writes Benidickson, "no doubt deliberated whether to drink from the top or bottom two-thirds of the glass." The author's thesis is that over time, rivers, lakes, vulnerable aquifers and coastal waters have been sacrificed to waste through ignorance of the consequences and misunderstanding and delusion about the apparent infinity of the oceans. Until now, the author writes, we've seen the flush-and-forget approach as "safe, efficient, necessary, non-political and totally unremarkable." But we can't afford to anymore. Benidickson echoes the words of Justice Dennis O'Connor who presided over the 2002 Walkerton inquiry: "We may have become victims of our own success, taking for granted our drinking water's safety. The keynote in the future should be vigilance."